If you plan to run outside in colder weather, a good pair of thermal tights are critical to keep your legs warm. Thermal running tights are similar to other running or compression tights, but with one major difference: They are built specifically for colder-weather running, so they are a key piece of your cold weather running apparel arsenal. The “thermal” qualities of the tights vary, but they provide more warmth and heat management than a typical pair of compression running tights. Thermal running tights are almost always made by the same makers and brands of running compression tights, and generally speaking the higher-end compression tights makers also make some of the best thermal tights out there. The one exception to the rule is that many of the ski gear makers like North Face and Columbia also make thermal running tights that test out quite well. Most thermal tights nowadays are still quite thin — a big advancement over a decade ago when makers struggled to get thermal properties into a sleek package. If you are determined to run outside (which we commend and agree with) rather than be relegated to a treadmill inside, here is the guide on how to keep your legs (and your all-important knees) warm. Thermal running tights resemble their non-thermal cousins, but they include a layer of heat-retention fabric. This thermal layer is normally made of some type of synthetic fabric, or a combination of wool and other warming threads. The outer layer usually is similar to compression tights, made of lycra, spandex or a mix. In higher-end thermal tights, the thermal layer is often sprayed-on so it is really one piece with the outer layer. For those who are just getting started running, we recommend thermal tights for anyone in a climate that dips below 50 on a regular basis. Thermal tights are normally meant to be worn alone, but can also be used as a base layer. The amount of cold, and level of wind or precip will often determine if the garment should be a single layer or combined with other layers. As for compression qualities, some thermal tights may be in the 15-20 mmHg range of compression, but most models are not measuring their compression levels precisely. Their main function is to keep a runner warm, and do so in a way that is snug and comfortable during athletic movement. Thermal tights come in all shapes and sizes, and all kinds of price ranges. When looking for thermal running pants, there are a few things to keep in mind and be on the lookout for in order to maximize your use and investment. Warmth. It might go without saying, but when looking for thermal running tights, you are probably interested in something that will keep you warm. While you probably can’t test the pants in cold weather before making the buying decision, you can inspect the insulating layer to be sure it feels adequate to your needs. When doing this, make sure the insulation goes the full length of the tights – some cheaper makers only use it on key areas like knees and thighs leaving the tights too skimpy for many. You want insulation over the knees, as maladies ranging from arthritis to runner’s knee can cause knees to hurt more in cold weather. Wind Resistance. Our favorite thermal pants are ones that have some sheen on the exterior, doing a better job of keeping the effects of wind off. This is a must when buying a cycling thermal tight, but important for running as well. If you inspect the tights and they have almost a waxy sheen on the exterior, it is probably a wind-resistant shell and a good thing. The tights that are sold as cycling or skiing tights often have this kind of wind-resistance as a core feature. The Pearl Izumi Select thermal tights are a great combination of fit, comfort, and warmth. something that is a bit tighter. First, you typically can move with more agility if you don’t have long pantlegs hanging off your legs. Second, a tighter fit on your running pants does a much better job of keeping wind out and heat in. Third, some of the more expensive tights on the market provide compression qualities, which can help keep key ligaments and joints in place during a long run. Experienced runners will tell you that they experience more join and muscle pain in colder weather. Length. You will see many thermal tight, especially the higher-end models, sold in both a full-length and a ¾ length version. Why in the world would anyone want a ¾ length garment when it is supposed to keep you warm? Easy – most buyers of the ¾ models are doing so for skiing, and they actually want the tights to end right about where the ski sock or ski boot will reach up to. For runners, you don’t want the ¾ length. You should go for the full-length thermal tights every time. In fact, something a little on the long side is going to be better than having gap of exposed flesh on your ankle. Build / Materials. Not all running tights are the same, and we have done our best to exclude any poorly made tights from the list below. You will want to look for flatlock seams that are barely noticeable against your skin, as well as stitching that is subtle and low-profile. It is also important that the fabric be highly breathable, as a run that begins at 40 degrees can often end at 55 degrees. You need to be ready for the entire range. Brand. We are not ones to shape solely based on the brand names on the label, but the fact is that there are some makers of colder weather running gear that are just more experienced and knowledgeable than others. All of the brands listed below are excellent when it comes to the quality of cold weather active wear. Be wary of the cheap, imported brands that are likely made by people wanting to make a buck, and who may not have ever gone on a cold weather run in their life. Price. That brings us to price, and the fact is that you should expect to shell out some money for a quality pair of thermal running tights. It is an investment, though, and in this case an investment in your comfort and health. We will outline the options below, but you can typically find a good pair of quality thermal tights that will last you for a long time in the $70 range. If you are willing to spend over $100, you can really have some fun with running tights that will feel and look great. Remember, you might wear these tights on 500 runs — a few extra bucks is worth it. We have examined the market for the upcoming fall and winter, and tested most of these brands ourselves in both running as well as cycling. We think these are the thermal running tights that are worth considering and that would make for a good long-term investment. 2XU’s thermal tights are top-of-the-line winter compression tights. 2XU Thermal Compression Tights. $$$$ Find Here. 2XU is a trusted maker of all thing compression, and they have built a thermal compression tight that is high-quality and comfortable. The make an excellent base layer, and are also intended for Nordic skiing. We find that they are a good single layer if used above 30 degrees, and make an excellent base layer below that. 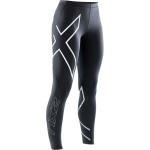 The lycra blend that is used in much of 2XU’s gear adds a spray-on thermal layer for the colder-weather tights. Note that 2XU typically fits quite snug, so when in doubt err on the larger size. Skins S400 tights are among the best we tested. Skins A400 Thermal Compression Tights. $$$$ Like the 2XU, the Skins A400 Thermals give you gradient compression, so you will not only be buying a base layer but also a good compression tight. The benefits of compression gear are many, but especially proven when it comes to recovery. The thermal qualities are provided by a synthetic blend of polyamind and elastine, two materials that are long-lasting and comfortable on a run. Skins has been in the business for a long time, and is not trying to be all things to all people – they make great tights. The design of the Skins is such that they probably look better as a base layer than an outer, but certainly have the ability to be either. Skins Thermal tights are hard to find given some of the production hiccups at skins, but you can find their main A400 tight, here. Sugoi Midzero Thermal Tights. $$$$ Find Here. The Sugoi Midzero tights are standard cold-weather tights from Sugoi, one of our most trusted gear makers. With the Midzero, they have included the Sugoi S2 thermal insulation, a layer that tends to do very well in colder temps and keeps runners warm down to about 30 degrees. Definitely intended to be used as an outer layer, we found that they worked very well for cycling over bike shorts as well. The pricing is lower than the 2XU and Skins, mainly because they are not touting compression qualities – just a good, solid pair of cold weather tights. North Face’s experience in cold weather gear shows in their thermal tights. North Face Winter Warm Tights. $$$ Find Here. You can’t have a list of cold weather active wear without including North Face – they have earned their reputation as one of the best for skiers, but that also translates to running and cycling. The Winter Warm Tights are probably the best looking tights in the bunch, and definitely intended to be used as a single layer, but can be a base layer in very cold temps. The main fabric is elastane which will keep the tights in shape for a long time, and they have a poly/elastane knit for the thermal layer. The tights come with features like reflective accents and a rear pocket. A great all-around tight for many different winter activities. Arcteryx Trino Tights. $$$ Find Here. We are loving the Trino tights by Arcteryx. We’ve known Arcteryx for years as a maker of some of the best outdoor hiking and active gear on the market, and their entry into the core running market is welcomed. The design is great — seams are comfortable, there is a hidden pocket for cash or an iPod, and the material stays dry even when you are sweating considerably. They are great in temps as low as about 20F, and as high as about 55 before they get too warm. If in doubt, order a size up. They tend to run a little snug. You will find these tights to be highly-versatile, so plan to use them for any cool-weather activity, not just running. Garneau Oslo Tights. $$ Find Here. The Louis Garneau (LG) brand has long been known for its cycling wear, and these are probably cycling tights at the core. However, we have been known to buy excellent LG cycling tights and use them for a wide range of uses, including running, being very pleased with the result. They are moisture-wicking, warm, and use a 10-panel design to help provide compression where you need it and range of motion where it matters. LG also does a great job of making their products a bit more wind-resistant, given that so many use the gear for cycling. The price is a little lower than it used to be, because LG appears to be phasing these out — so we actually think these tights are a nice bargain on the market, and the typical cold weather runner will be happy with them. The Pearl Izumi select line has always stood up well to our testing. Pearl Izumi Select Thermal Tights. $$$ Find Here. The Pearl Izumi Select Ride tights are among the most comfortable we have had the opportunity to wear. At first, they seem too thin to be effective thermal tights, but then you begin running or riding in cold temps and you quickly realize your legs are the warmest part of your body. They fit snugly so you don’t want to have too much underneath them, but for most folks they will give you all the warmth you need. The waistline is snug but comfortable even if untied. They run a bit long, which is fine for all but the shortest runners or cyclists. Nike Therma Tights. $$ Find Here. Unlike most of the others on this list, there are more “pants” than tights, if you prefer a looser fit. We like the firmness of tights, but some are more used to the good old-fashioned sweat pants feel. Nike is a trusted maker of all things running, and we like the tights for the money. If pressed, we might choose one of the makers who specializes in colder weather gear, but that is not to take anything away from these tights that use Dri-Fit fabric and are easy to take care of. Note that they are stiff at first, but will become comfortable with a little wear. UA Cold Gear Infrared Run. $$ Find Here. While the UA tights are a good all-round tight, we mainly included them on the list because they can often be found at a lower price point given Under Armour’s discounting. The Cold Gear lineup has a broad array of products meant for cooler weather, and the Infrared tights are intended for running. They offer a high degree of flexibility and decent warmth. These tights are intended to fit very tightly, providing some basic compression benefits. Overall, a good pair of tights that we are proud to include on our list, but we would compare them with some of the others above and then make our decision. Don’t skimp on your thermal running tights. If you live anywhere where you will find yourself on runs in temps below 50 degrees, having a good pair of thermal tights is a must. While you are at it, check out our updated pieces on running jackets and running gloves, so you can be all set for the winter running season.